Bay Area rapper Raashan Ahmad dropped his last album, For What You’ve Lost, at the end of last year but it was largely overlooked by mainstream media, ‎ which is a real shame considering that this kind jazzy hip-hop album is pretty hard to come by. Rasshan’s flow is as smooth and effortless as ever and there are some solid tracks here, as evidenced by the second single taken from the album “Pain On Black”. Originally from Pasadena, Raashan Ahmad has been on the grind since his first release as one of the lead M.C.s in the Boston formed group Mission, who released a self titled album in 1999. He’s also the front man for San Francisco live hip-hop group Crown City Rockers who have released two albums so far: Earthtones in 2004 and The Day After Forever in 2009. 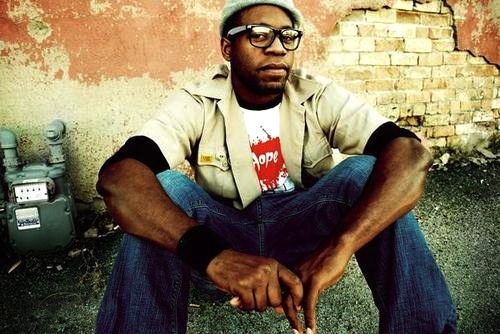 In 2008 Ahmad made his solo debut with The Push, thirteen tracks of soulful hip hop featuring production from DJ Vadim, Headnodic (of Crown City Rockers/Mighty Underdogs), Stro the 89th Key (of The Procussions), Descry and more. With his reputation growing, Raashan then released his first solo album The Push which solidified his place as one the most innovative and versatile MC’s to look out for. Now Raashan last album might be his best material to date. For What You’ve Lost is a heavily collaborative musical journey sure to give his fans what they’ve been waiting for. This album is rooted in classic hip hop tradition as well as jazz, soul and funk while continuing to push musical boundaries. Guest appearances ranging from new soul heroes like Aloe Blacc and Noelle Scaggs to hip hop veterans like Gift of Gab and Count Bass D make this album diverse and colourful. This new album truly shows Raashan’s evolution and growth.